Information in this executive summary was correct as at 31 August 2018. Those who do not engage with mainstream schooling, such as those who are electively home educated, choose not to engage with school or are excluded are at greater risk of not achieving strong educational outcomes. Social isolation from peers can lead children and young people to act out or withdraw from the networks and community around them. This may be characterised by incidence or prevalence of bullying. Children and young people who may be disengaged from learning due to not being able to get the support that they need to participate are also more likely to become the perpetrators or victims of crime. It is also recognised that looked after children, those from areas of deprivation and/or communities which traditionally do not value mainstream education, such as Gypsy, Roma and Traveller (GRT) communities are at much greater risk of achieving much lower educational outcomes than peers. The proportion of children in poverty in Surrey has remained around 10% for the past five years. 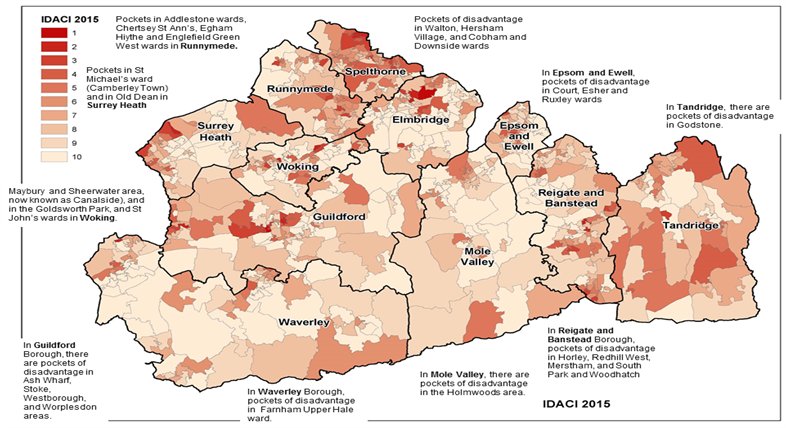 Although Surrey’s average rank of deprivation is 150 out of 152, there are small, concentrated pockets of disadvantage in all eleven districts and boroughs across the county. 75 % of children and young people living in households that are dependent on out of work benefits are under eleven years old. In Surrey 7.5% of pupils in state-funded schools (11,200) are known to be eligible for FSM, compared with 14.3% nationally and the number of learners eligible for support through Pupil Premium increased from 23,910 in 2017/18 to 23,971 in 2018/19. 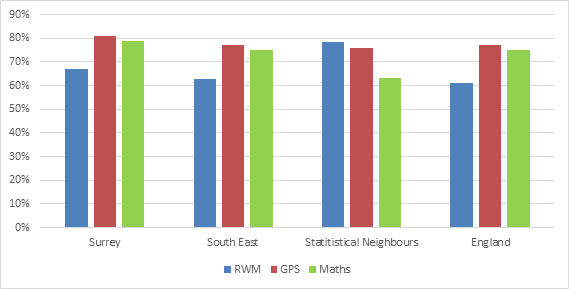 The proportion of disadvantaged Surrey pupils achieving the expected standard in Grammar, Punctuation and Spelling (GPS) and Reading, Writing and Maths (RWM) at Key Stage 2 (KS2) is lower than for those without disadvantage and is also below the national average. In 2015, Surrey was ranked 21st for the performance of its non-disadvantaged children but 71st for that of its disadvantaged young people in relation to the achievement of five GCSEs at grades A*-C at Key Stage 4 (KS4). This measure has now been replaced by one known as Progress 8. A similar picture is seen in relation to the progress of disadvantaged learners who scored -0.43 compared to a national average of -0.40. The proportion of Surrey looked-after children who are persistently absent from education is higher than the national average. 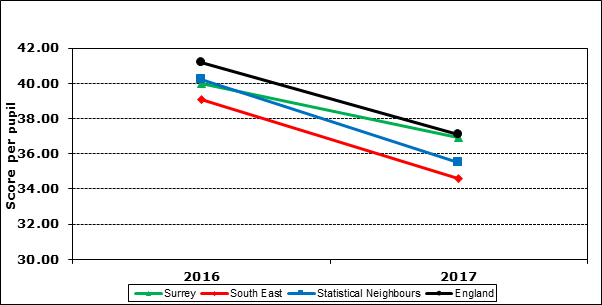 Between 2015 and 2017, nationally the average was 9.4% but was 10.2% in Surrey. As at 14 August 2018, 30% of looked after children were placed out of county and more than twenty miles away from their community with three or more placements. Places in Surrey Schools are offered to and planned for all pupils, although some end up taking up places in the independent sector or electing to home-educate. The Council’s aim is that all schools in Surrey are good schools, serving their local communities. 94% of schools in Surrey are judged to be good or outstanding and overall performance is in the top 20% of Local Authorities (LAs) across all Key Stages. While local authorities continue to hold a range of statutory duties with respect to education, previous central grant funding for local authorities for school improvement has ceased and been replaced by a Monitoring and Brokering. The grant for 2018-19 remains the same as the previous year, but its future is uncertain as the expectation is that support for school improvement will come more from the schools themselves with local authorities playing a more limited role. Our failure to meet the needs of vulnerable children and young people, and prevent their needs from escalating, is driving up demand for high cost statutory services. Poor outcomes, high need and high cost of service are inextricably linked. Although Surrey spends more on school improvement than the national average per capita, this funding needs to be better targeted to improve outcomes for vulnerable children. Similarly, the low take-up of the Pupil Premium in Surrey must be addressed in order to maximise the resources available to improve the achievement of disadvantaged children. It is clear that the curriculum and educational institutions available in Surrey are not fully meeting the needs and expectations of all children. More vulnerable groups who opt out of the system are at risk of achieving lower outcomes than their peers. The persistent inequality in educational outcomes suggests that the whole system in Surrey is less effective in supporting the learning and development of children from our identified vulnerable groups. Best practice around the use of Pupil Premium for KS4 pupils refers to the use of the Education Endowment Foundation (EEF) Teaching and Learning Toolkit. This Toolkit develops strategies beyond the classroom that have enabled disadvantaged students to achieve the same educational outcomes at KS4 as their peers. The provision of Early Help intervention and support services which target vulnerable groups of children, in particular, integrated models that take a whole family approach, promote restorative practice and use evidence-based interventions have proven to improve outcomes and the quality of experience for vulnerable children and families. The Department for Education (DfE) and Office for Standards in Education (Ofsted) have published various guidance on tailoring educational delivery to support specific vulnerable groups. Partnerships with other LAs which have a trend of strong results for disadvantaged young people would be beneficial, although consideration should be given to the characteristics of such Authorities in comparison with Surrey. Having access to vocational opportunities and the provision of good quality, impartial careers education, information, advice and guidance at KS4, in line with national government policy, will introduce more flexibility into the curriculum offer and settings. Increasing the percentage of pupils achieving the expected standards at KS2 and KS4. Reducing the percentage of pupils’ persistent absence and exclusion from school. Increasing the proportion of learners making good progress in Writing and Maths between the ages of 7 and 11. 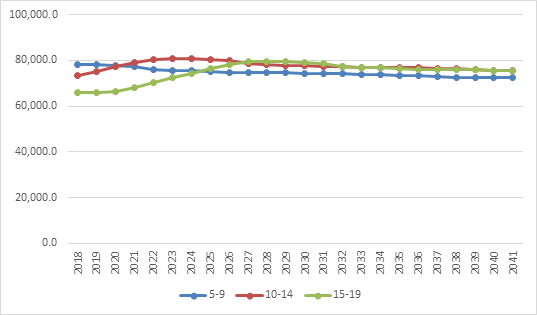 Increasing the percentage of FSM learners who enter higher education (HE) by age 19. Ongoing work to help schools explore options for formal partnerships, particularly in the current financial climate, should continue. We should establish a school improvement transition steering group to identify priorities for school improvement, monitor progress and provide accountability for outcomes. The educational progress and achievement of vulnerable children in Surrey is concealed by very high results and comparative performance among the majority of more advantaged learners. Although having special educational needs and disabilities (SEND) is a key category of disadvantage used in national indicators, this is covered in detail within the dedicated chapter on Children and Young People with SEND. This chapter will focus on other aspects of disadvantage in Surrey. 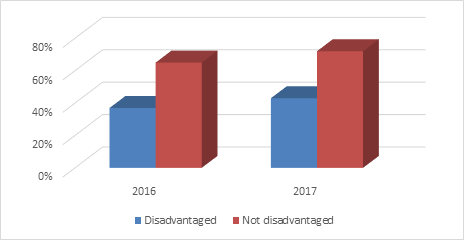 For children with disadvantages such as poverty or absence of biological family, outcomes tend to be poor when compared to the Surrey average and even with the national average. In Surrey, Children who are in receipt of free school meals (FSM) are only around half as likely as their non-FSM peers to achieve the expected standard at Key Stage 2 (KS2) in Reading, Writing and Maths (RWM). Disadvantaged children tend to regress between the end of KS2 and Key Stage 4 (KS4), are around 30% less likely to achieve 9-4 in English and Maths and 22% less likely than their more affluent peers to enter higher education (HE) by the age of 19. Though there are proportionately fewer disadvantaged learners in Surrey, their achievement compared to non-disadvantaged pupils is much worse than national levels of performance, which demonstrates that the county is relatively weak at providing the support required for more vulnerable learners to achieve strong educational outcomes. Surrey has a statutory duty to make provision of education available for all children from age five to sixteen. Information on birth rates, planned housing developments, pupil movement trends and travel-to-learn patterns for young people informs forecasts of demand. Surrey’s population has increased every year since 1987 and is estimated to continue to grow to 2037. This will put pressure on the current schooling capacity and an increase in the population of school-age children will mean more vulnerable students requiring support. The provision of additional school places, improving outcomes for children in need of support and protection and supporting young people to participate in education, training and employment are all identified within the strategic goals in Surrey’s Corporate Strategy 2017-22. Education and Skills therefore warrants a stand-alone chapter within the JSNA. The majority of children in Surrey take up places within mainstream schools and go on to achieve good educational outcomes. However, there are distinct groups of young people who do not take up school places, disengage from them or have characteristics which make them vulnerable and less likely to achieve well. Some families elect to home educate their children due to dissatisfaction with the traditional school curriculum or settings, or remove them from school following incidents of bullying. Others choose not to engage with school at all or are excluded. Those who do not engage with mainstream schooling, either through opting out or disengaging during statutory school age, are at greater risk of not achieving, which is likely to have a further impact on their wellbeing and economic chances. Without achieving good educational outcomes, young people are less likely to engage with society and more likely to become the perpetrators or victims of crime. Where children and young people struggle to socialise with their peers, they can become disengaged from the networks and community around them. This can lead them to either act out or withdraw; both actions can make them vulnerable and put them at risk. Looking at the incidence and prevalence of bullying is important because if children feel isolated and alone it can lead to disengagement from education and poor outcomes across health, social care and education. Disengagement from education is a concern for some very specific groups and, although the exact reasons can vary from child to child, broadly speaking disengagement occurs because pupils are not able to get the support that they need to participate. The definition of a disadvantaged pupil was changed to reflect changes to the conditions of funding for the Pupil Premium in 2014-2015. A pupil is defined as disadvantaged if they have been eligible for FSM in the last six years, looked-after continuously for one day or more or adopted from care. Children who are looked-after, from areas of deprivation and/or from communities which traditionally do not value mainstream education, such as Gypsy, Roma and Traveller (GRT) communities, are at much greater risk of achieving lower educational outcomes. Other characteristics which can put a child in a position of disadvantage include being a young offender, having attendance of less than 80%, speaking English as an additional language (EAL), being pregnant or a teenage parent, being a young carer, experiencing family issues, like bereavement or parental separation and suffering substance misuse, mental health or other health issues. Evidence suggests that young people experiencing the identified risk factors above are likely to perform less well than their peers at KS2 and KS4, both nationally and in Surrey. Surrey has 2.20% of the population of children aged 0-17 in England. Approximately 194,842 students are educated in Surrey schools. The Office of National Statistics (ONS) projections suggest that Surrey’s population will continue to grow in the foreseeable future, rising to 1,227,500 people by 2023. This is a net increase of just over 8% in 12 years. Detailed data on the forecast levels of demand for school places within each borough in Surrey is provided in the School Organisation Plan 2018 – 2027. Both nationally and in Surrey, children from deprived communities experience lower than average outcomes across education, health and social care. Surrey’s average rank of deprivation score is 150 out of 152 but there are small, concentrated pockets of disadvantage in all eleven districts and boroughs in Surrey. The proportion of children in poverty in Surrey has remained around 10% for the past five years. The neighbourhoods which experience the greatest gaps are concentrated within the most affluent, least deprived wards. Eligibility for FSM is a key proxy indicator of deprivation in the measurement of educational outcomes. In Surrey, 7.5% of pupils in state-funded schools (11,200) are known to be eligible for FSM, compared with 14.3% nationally. The number of learners eligible for support through Pupil Premium increased from 23,910 in 2017/18 to 23,971 in 2018/19. Analysis of performance levels in Surrey demonstrates the disparity in educational outcomes between children with and without disadvantage. At KS2, the Department for Education (DfE) measures the proportion of children who have achieved the expected standard in RWM. In Surrey, the difference in this data between those children who are disadvantaged and those who are not is marked. Despite an improvement in performance, the increase in general standards means that the attainment gap remains significant. 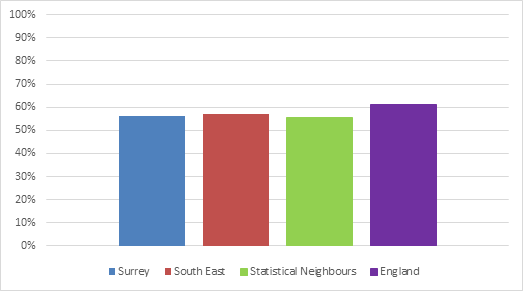 Figures 4 and 5 show the achievement of disadvantaged Surrey students compared to regional and national levels in Grammar, Punctuation and Spelling and Reading, Writing and Maths. When looking at KS2 averages for all pupils, figures are boosted by the inclusion of non-disadvantaged children, making Surrey’s performance against regional and national averages appear stronger. When examining the progress made by children between the ages of seven and eleven in Writing, Surrey does not perform well and shows a negative value-added score, although is stronger than its statistical neighbours and the South East average. Surrey’s national ranking for this new measure in 2017 was 99th. This data provides a picture for all learners. However, we know that this is likely to mask even greater inadequacies in the achievement of disadvantaged learners. Pupils’ progress in Maths follows a similar pattern, where Surrey precedes its Statistical Neighbours and the regional average but falls well short of the national average and is ranked 94th in the country. The traditional KS4 measure of the achievement of five GCSEs at grades A*-C has now been replaced by a new indicator. In 2017, Surrey was ranked 23rd for the KS4 Attainment 8 score per pupil of its non-disadvantaged children but 55th for that of its disadvantaged young people. 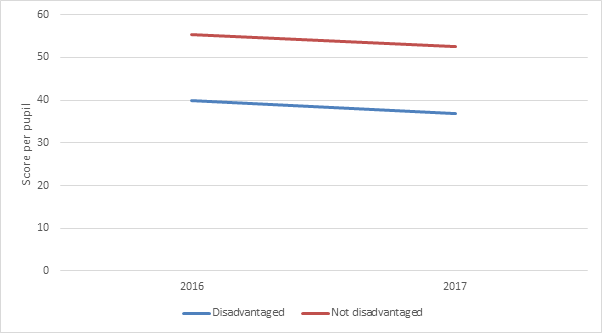 Compared to regional and national averages, Surrey once again performed favourably for its non-disadvantaged learners from 2016 to 2017 but, for its disadvantaged pupils, it fell short of the national average. 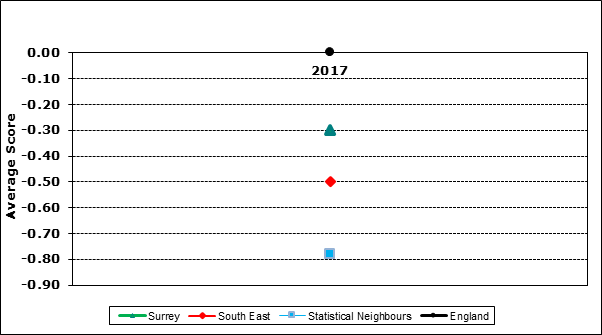 Under the new Progress 8 measure in 2017, Surrey recorded a lower value-added score (-0.43) for disadvantaged pupils compared to the national average of -0.40 but a higher score (0.25) than the national average of 0.11 for non-disadvantaged learners. The county outperformed the South East average and its statistical neighbours for both measures but had a national ranking of 66 and 31 respectively. In tracking learners from the age of 15 from state-funded and special schools who entered HE by age 19, Surrey lags behind national statistics, with a 22% gap between those who received FSM and those who did not, compared to an 18% gap in England, and only 6% of all students progressing to HE from Surrey having had FSM, compared to 14% across the country. Whilst Surrey is often on a par with or better than the averages for the South East and statistical neighbours for the attainment of disadvantaged young people, it consistently falls short of national performance levels. Children in Surrey are experiencing disruption in their education and their social support networks, in particular looked after children, our most vulnerable care leavers with multiple complex needs and GRT children and young people living in housing situations that are physically unsuitable and less likely to meet modern housing standards. As at 14 August 2018, 30% of looked after children were in out of county placement and more than twenty miles away from their communities with three or more placements over the last twelve months. 26% of secondary school aged pupils at least ‘sometimes’ feel afraid to go to school because of bullying. Nationally, numbers of fixed period exclusions have seen a consistent increase from 2012/13 to 2016/17. Numbers of fixed period exclusions in Surrey have followed a similar pattern with an increase of over 1000 between 2012/13 to 2016/17. 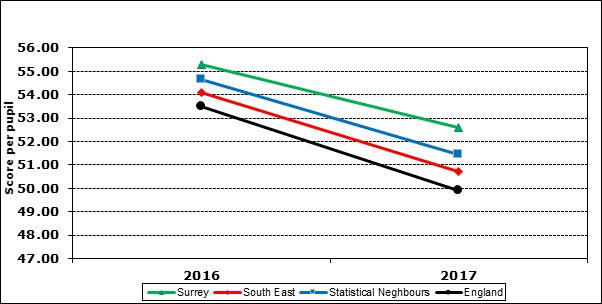 Surrey has a lower proportion of looked-after children with at least one fixed period of exclusion from education than the national average but this has been a particularly volatile statistic. Surrey has higher proportions of looked-after children who are persistently absent from education than the national average and this has been a trend over several years. Between 2015 and 2017, nationally the average was 9.4% but was 10.2% in Surrey. There are four nurseries, 299 primary schools, 54 secondary schools, 22 special schools and eight pupil referral units in Surrey. There are also 109 independent schools. The law requires that parents and carers make arrangements, and Local Authorities (LAs) make provision for, the education of children from the first term they begin as a five year old to the end of the academic year in which their sixteenth birthday falls either at school or otherwise. Most parents choose to send their children to Surrey schools but some parents will choose to educate their children independently, either at independent schools or otherwise than at school. Others will send their children to maintained schools outside of Surrey (as Surrey maintained schools admit some children from other areas). From age 14 to 16 a minority of children are offered college placements, usually through school link programmes. All pupils, whether they end up taking up a school place in the independent sector, are offered a place in Surrey schools. Surrey’s Corporate Plan, Children and Young People’s Plan and Surrey’s Vision for Learning recognises that all children and young people are entitled to high quality educational provision. Key to this aim is that all schools in Surrey are good schools serving their local communities. 94% of schools in Surrey are judged to be good or outstanding and overall performance is in the top 20% of LAs across all Key Stages. Surrey has a Joint Venture, Babcock Four S, through which it delivers a range of support services to Surrey schools, including assistance with school improvement. These services include statutory activities for the LA and others judged to be of strategic importance to the Council. At KS2, the average class size remained the same in 2017 and 2018 at 28.2, with 18.6% of students being taught in classes of more than 30.29 Last year, there were 8397 full-time equivalent teachers working in Surrey and a 10% vacancy rate. In line with national policy, most Surrey schools have converted to academies and become autonomous, which has altered the LA role. Funding for schools has changed with the National Funding Formula (NFF) having been introduced in April 2018. While local authorities continue to hold a range of statutory duties with respect to education, previous central grant funding for local authorities for school improvement has ceased and been replaced by a Monitoring and Brokering. The grant for 2018-19 remains the same as the previous year, but its future is uncertain as the expectation is that support for school improvement will come more from the schools themselves with local authorities playing a more limited role. The demand for schools places changes over time. Increases in demand can lead to the creation of a new school or the expansion of schools to add permanent or temporary additional classrooms. Surplus places can also mean the reduction of school provision in an area through reduced admission arrangements or the rationalisation of school provision. Despite persistent inequalities in educational outcomes for vulnerable children, national benchmarking indicates that we spend more on school improvement than the national average per capita – £44 (Surrey) vs £28 (national), indicating that we need to target this better at raising the outcomes of vulnerable and disadvantaged children. Low take-up of the Pupil Premium in Surrey also reduces significantly the resources available to improve the achievement of disadvantaged children. For Pupil Premium, the total funding claimed in 2018/19 equates to £28m. However, DfE statistics suggest that 29% of eligible children in Surrey are not being claimed for, which is the fifth highest rate nationally. The traditional curriculum and settings are not fully meeting all needs and expectations, e.g. children from GRT families and some of those who opt for home education. The Education Policy Institute identified the gap in educational attainment to be greatest within secondary education, acknowledging the numerous factors that have potential to contribute to this such as sufficiency of funding. Best practice around the use of Pupil Premium for KS4 pupils, acknowledged through the annual Pupil Premium Awards, refers to the use of the Education Endowment Foundation (EEF) Teaching and Learning Toolkit, developing strategies that go beyond the classroom to include personal and social development and the development of robust mechanisms to continually monitor performance and respond to emerging needs in a timely manner. For many of the identified characteristics of disadvantage, the level of impact they have on education achievement and progress may be controlled through the provision of intervention and support services. In Surrey, we have identified the Early Help approach as a key vehicle through which to improve engagement with and achievement in education. Integrated models that take a whole family approach, promote restorative practice and use evidence-based interventions have proven to improve outcomes and the quality of experience for vulnerable children and families. The factors for targeted Early Help support are based on our needs analysis, national research for the government’s Troubled Families programme and emerging research on predictive models for Early Help and include children being from GRT communities, having poor educational attendance and being looked-after. Clearly, other LAs across the country are delivering much stronger results for their disadvantaged children and we can learn from them, although it should be noted that Surrey’s performance for disadvantaged pupils tends to be similar to that of its statistical neighbours, which suggests that the make-up of an authority is an important contributory factor. Therefore, it is too simplistic to suggest that by mirroring the actions of a more successful Authority we will automatically deliver significant improvements. By giving young people at KS4 more access to vocational opportunities and providing access to good quality, impartial careers education, information, advice and guidance, in line with national government policy, we can introduce more flexibility in the traditional curriculum and settings we offer, which we have identified as a gap. These recommendations seek to improve educational outcomes for all children by focusing on the most vulnerable. Concentrating on the outcomes of the most vulnerable will improve overall attainment levels and have a positive reputational impact. Aside from ongoing school organisation and place planning work to address changing levels of demand, which is a statutory duty, educational inclusion shall be our primary focus for future commissioning work. Increase the percentage of pupils achieving the expected standards in GPS and RWM at KS2. Reduce the percentage of pupils persistently absent, CME, PMooE and permanently excluded from school each year. Increase the proportion of learners making good progress in Writing and Maths between the ages of 7 and 11. Grow the percentage of pupils making expected or better progress against the Progress 8 measure at KS4. Increase the percentage of FSM learners who enter HE by age 19. The current contract with Babcock for our Joint Venture, Four S, is scheduled to end in March 2019. Surrey County Council and Babcock 4S should therefore make provision to ensure that services to schools are maintained. Key Stage 2 is the legal term for the four years of schooling in maintained schools in England and Wales normally known as Year 3, Year 4, Year 5 and Year 6, when the pupils are aged between 7 and 11. Key Stage 4 is the legal term for the two years of school education which incorporate GCSEs, and other examinations, in maintained schools in England normally known as Year 10 and Year 11, when pupils are aged between 14 and 16. N.B. In 2016, the new more challenging national curriculum, which was introduced in 2014, was assessed by new tests and interim frameworks for teacher assessment. Results are no longer reported as levels: each pupil receives their test results as a scaled score and teacher assessments based on the standards in the interim framework. The new expected standards were designed to be broadly similar but are not equivalent to an old level 4b. The performance descriptors, used by teachers in the standard setting process, were developed with an understanding of the performance of pupils working at level 4b. However, given the curricula differences, there is not a direct equivalence between the new expected standard and level 4b in previous years. Progress 8 aims to capture the progress a pupil makes from the end of key stage 2 to the end of key stage 4. It compares pupils’ achievement – their Attainment 8 score – with the average Attainment 8 score of all pupils nationally who had a similar starting point (or ‘prior attainment’), calculated using assessment results from the end of primary school. Progress 8 is a relative measure, therefore the national average Progress 8 score for mainstream schools is zero. When including pupils at special schools the national average is not zero as Progress 8 scores for special schools are calculated using Attainment 8 estimates based on pupils in mainstream schools. DfE (2016) Permanent and fixed period exclusions in England. London: Department for Education. Available at: https://www.gov.uk/government/collections/statistics-exclusions.